Crimson red is one of the most challenging colors to work with and one of my favourites too. While using crimson one cannot afford to make any errors , no overworking the color - infact one has to get it right the first time around. This is so because if you add a second layer the color loses its transparency and looks dull and if you correct it with white, it turns pink losing the very subject of the painting - Red Roses. This painting was done while remembering my first painting in the series of red roses that was sold and was sorely miseed by everyone in the family. 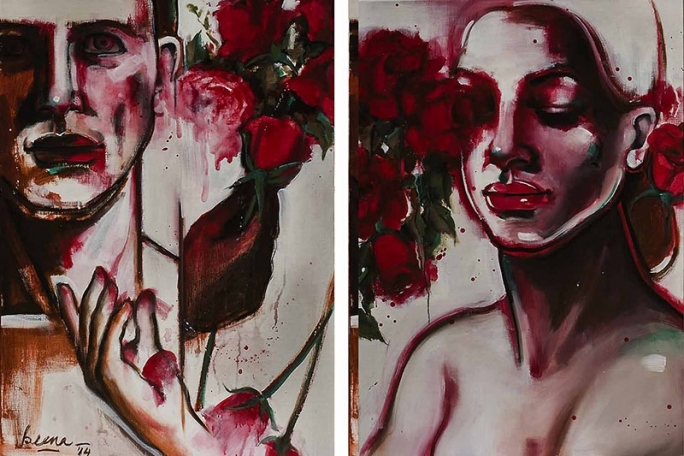 I did this one as a diptych as I wanted a disrupted flow of crimson with a juxtaposition of the male/female hands and body, and have used minimal color on white to bring out the freshness of the roses. How To Develop Your Own Art Style? Can Acrylic Paint Be Made To Seem Like Enamel?